Leaderboard bugfix for 2.2, old version check, auto-disables after 10 failed attempts. Added Language menu, Online Data option. I fixed the graphics, added achievements/challenges and translations. it in the 3d world. 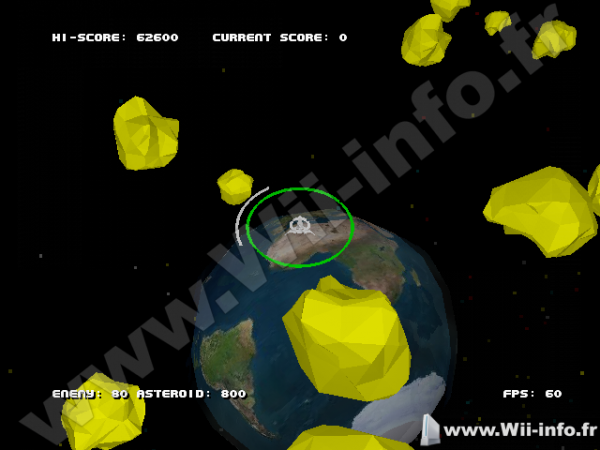 asteroids to 500 making the game more of a resource grab and bullet hell than before. I clear out the area around the player when you start in Hard or Easy because it was getting difficult to escape the fire just as you start playing. Easy mode has more asteroids, less enemies and no over heating. Normal is normal. * Added a new achievement called "50k wildfire" for shooting 50,000 bullets. It accumulates across game so it should be easy to complete. Now I have a total of 21 achievements. * Music should loop correctly now. * I doubled the distance that the "Journey" achievement takes to complete. Its now 10,000 pixels. * Also note that I really cannot test the game in dolphin or Homebrew filter so if you are having framerate issues then you are out of luck. * You score on on screen by default now.